Successfully Added DLP Pico LED Projector - 60 Lumens, 500:1 Contrast to your Shopping Cart. 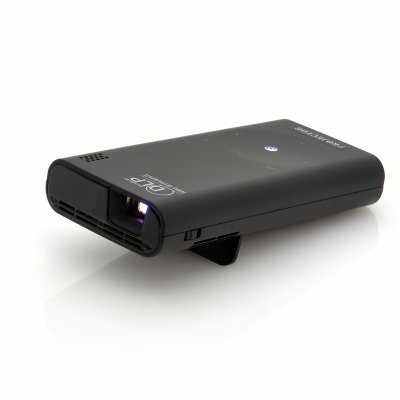 DLP Pico LED Projector with 60 Lumens and 500:1 contrast is a conveniently size portable device that can bring your media to life. A perfect companion to carry around due to its lightweight design, this projector is ideal to project your media from your mobile phone, tablet or other compatible sources. This projector uses DLP (Digital Light Processing) that creates an image by using microscopically small mirrors laid out in a matrix on a semiconductor chip, known as a DMD (Digital Micromirror Device). Every mirror represents one or more pixels in the projected image. The number of mirrors corresponds to the projector’s resolution and then the mirrors are repositioned rapidly to reflect light through the lens. This projector has 60 Lumens, however it will feel like a lot more and be used more effectively and efficiently than standard LED projection due to using DLP technology as it doesn’t require a high volume of lumens to project a great display. There are ports for connecting external media devices via a HDMI port or the micro USB port. The HDMI connection, if used with other HDMI compatible devices will produce an excellent and clear display. Download your compatible media files and upload them on to a micro SD card of up to 32GB and then play them directly by inserting the card into the projector’s micro SD port. The battery type is an embedded 3000 mAh Li-polymer rechargeable battery that can be charged up from the accompanying power adapter. This product will benefit someone in the business or educational field, as they can uses apparatus when showing their presentation without the aid of a heavy stationary projector. Being small and lightweight allows it to be moved to a position that suits you and the environment that you wish to display, also there is a built-in stand that flips out that elevates the projector for better angle. 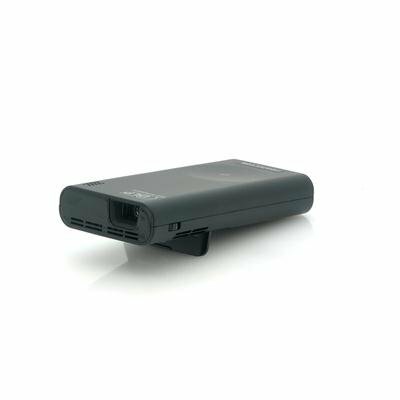 A great and convenient device that incorporates DLP technology for a clearer projection.. This product is in stock and can be dispatched within 24 hours of ordering with a 12 month warranty. Brought to you by the leaders in wholesale electronics and projectors, Chinavasion.